Large 3 bedroom home that could be 4 bedroom. The - Large 3 bedroom home that could be 4 bedroom. The home sits on 3.6 acres of land. Privacy is no issue. The home sits between plenty of trees to side and back and nice open space to the fornt of the home. This home has a large utility room and nice size kitchen. The Kitchen opens up to a very large living area/dining area. The master bath has a walk in bath tub with handi cap rails. 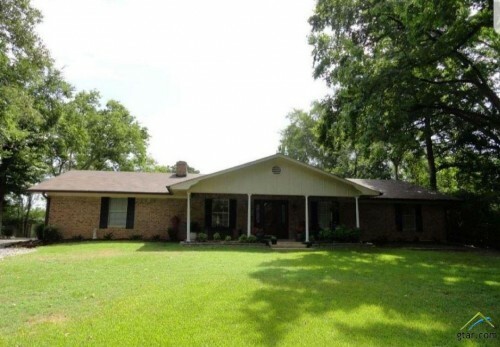 Gladewater Home - This 4 bedroom 2 bath home sits on 3.8 acres. It has plenty of space Inside and out. with a beautiful covered front porch.. Large Living room, dining room and kitchen. Very spacious Master suite and very nice size extra bedrooms and plenty of room in guest bath. Room to move in your laundry right off the back door. Ready for a weekend barbecue. Walk out onto a very spacious back patio and take a dip in your above ground pool and deck. Beautiful 1 bedroom 1 bath home on nearly 2 acres - Beautiful 1 bedroom 1 bath home on nearly 2 acres of land. Large shop with hook up for an RV, inside and out. The shop will easily house an RV Bus and 2 cars with more room to spare. It has a 1/2 bath and is foam insulated. Be comfortable Summer or winter it is AC and heated.It's a 40x50. Need more storage there is another storage unit just behind this Workshop it's 12x18. When you are ready to come inside take the sidewalk to the front of the home Open the gate to your white picket fence and relax on the covered front porch and take in the scenery. Ready to retreat indoors. Walk in to a great room and be captivated with porcelain floor tile and beautiful Aspen wood ceiling through out. The home is custom built through out with hand made maple cabinets, triple pane windows, foam insulated, radiant barrier, tankless water heater in home and shop and irrigation system. Range and microwave are convections as well.